and cosy. 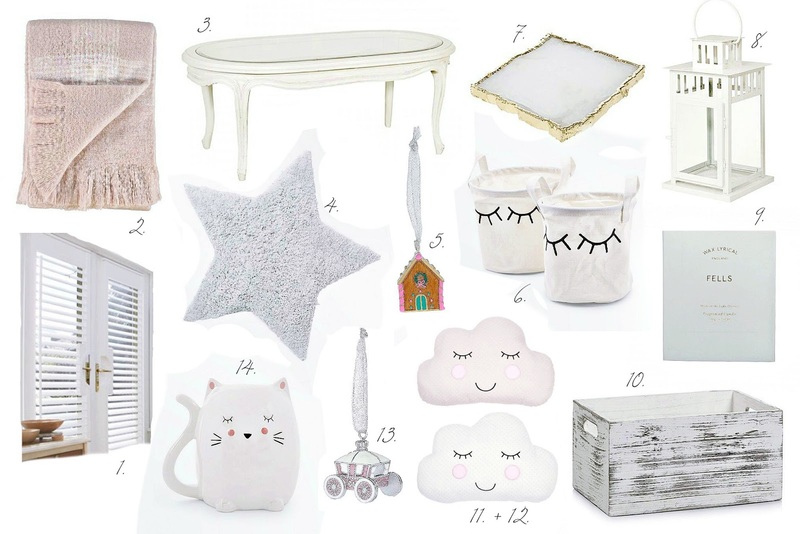 I've put together a snowy white wish list, minus important things like getting the guttering sorted and googling double glazing near me. I can't wait to record the whole process on my blog. With Christmas coming up, I had to throw in a few sparkly things. The little ornaments are so pretty! I'm thinking of adorning some shelves with them when the festive period is over, to keep them on display. 1. Conservatory shutters, Thomas Sanderson - we've been debating whether to go for blinds or window shutters. I love the look of these shutters but child safe, even remote controlled blinds are a really lovely sounding option too. I'd love to take the next step and get a quote, to see what suits our budget best. 2. Blush throw, TK Maxx - I live with all boys but I'm still managing to sneak in a dash of pink here and there, without turning the whole house in to my pink cave I wish. This is such a pretty throw, I love the pleated edges and it's such a soft, beautiful blush shade. The perfect accent to our white and grey room. 3. Chateau French oval coffee table, Oak Furniture House - even at half price this table is a little beyond my budget but it's so dreamy, I'd love to find a second hand table of similar shape and paint it an off white shade. 4. (I forgot where I found this darling rug but here is one similar, by Vertbaudet) - I'd love a soft, milky grey rug for the conservatory, keeping the decor light but it won't show up the dirt little boy treads in. 5. Gingerbread house ornament, Accessorize - this diddy gingerbread house bauble is so cute! I caved and bought three pretty tree ornaments from Miss Selfridges but if I had more money I would pick up a few from Accessorize, they have such a beautiful assortment too. 6. White Eyelash baskets, New Look - I love these little storage baskets, they would be perfect for storing bits and bobs, pegs or Oscar's toys. The eyelash design reminds me of Miss Etoile cups. 7. Gold rose quartz coaster, Monsoon - ohhh wow, the stuff of my Pinterest dreams! This is so beautiful! £12 is definitely expensive for a coaster but I could just stare at this all day. 8. Lantern from IKEA - whenever we pop in to IKEA I always drool over their dreamy lanterns and come away with a little tea light one. Mitch and I have a pact that when we've decorated we're going to buy the bigger ones and fill them with fairy lights, so cosy and relaxing. 9. Wax Lyrical, Fells fragrance range - I'm in love with the 'Meadow' range and can't wait to try more Lakes inspired scents. We're yet to buy actual furniture but I know what fragrance I'll be filling the room with! 11. and 12. Sass and Belle cloud cushions - both of these cushions are so pretty, they remind me of little marshmallows with rosy cheeks. I can't choose between white or pink, which one is your favourite? 13. Fairytale enamel decoration, Accessorize - another adorable tree decoration, this one is magical! I love that they are 3 for 2 at the moment too. They make such beautiful keepsakes and I've started buying decorations that aren't specifically Christmas designs, hoping that I can display them all year round. 14. Cat money box, New Look - I have the cup version of this money box, it's so cute! I really want to collect the whole range. I love that the tail acts as a little handle, Oscar would definitely love to try and play with it. I can't wait to makeover our little place to cuddle under throws and look up at the snow and the stars ♡ I'd love to know what you think! I'm so excited to see what I can create with our new conservatory. PS would you like to enter my festive Disney beauty goodies giveaway? How pretty is all that?!? Oh my gosh, this is all so pretty! oooh i love number 6! i recently got a print of these put up in my room and love the simplicity of the drawing. so cute! So pretty! Love these picks.